Air, water and food, in this order, are the core metabolic requirements for human life. A reduction in either the quality or quantity of any of these essential resources constitutes a major threat to human health. Due to the globalization of industrial production and energy needs, and to an increasing number of acute air pollution episodes in many cities worldwide, air pollution has become a growing concern over the past decade, with mounting evidence of its dramatic health impacts. Air pollution is today considered as the world’s most serious environmental health risk by the World Health Organisation (WHO). Numerous studies have consistently shown its deleterious effect on human health. It is estimated that polluted air was responsible for over 6 million deaths worldwide in 2016, twice as many as AIDS, tuberculosis and malaria combined. Ambient particulate matter, nitrogen dioxides and other pollutants have been associated with increased prevalence of a number of respiratory and cardiovascular diseases, cancers and even appear to be correlated with neurodevelopmental disorders in children and neurodegenerative diseases in adult. Data on air quality indicators is becoming increasingly available and the science underlying the related health impact is also evolving rapidly. As a global reinsurer with significant exposure to mortality risks, SCOR is monitoring the consequences of emerging risks that might have an impact on human life, such as air pollution, endocrine disruptors and anti-microbial resistance, to name a few. 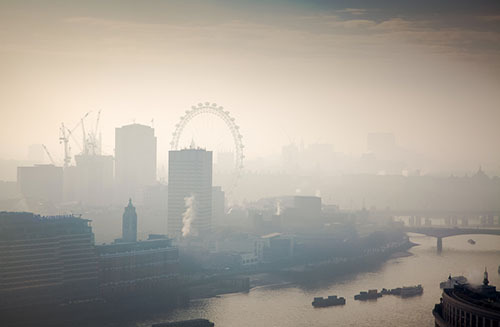 The (re)insurance industry has recognized that air pollution should be considered as an important emerging risk. 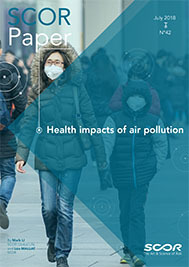 The SCOR Paper “Health Impacts of Air Pollution” presents the issue of air pollution and discusses the latest findings of fundamental research with regard to its consequences on human health. It is organized as follows: in the first section, the nature and dynamics of air pollution are described. In the second section, the consequences of air pollution on health are documented. In the last section, the consequences of air pollution on the (re)insurance industry are discussed. Mark Li, who joined SCOR in 2011, is responsible for underwriting, claims and medical issues for the Life & Health division in Beijing. He has more than 15 years of experience in the Life & Health insu¬rance industry and is a Fellow of the Life Management Institute. As a practicing doctor, he worked for 14 years at the Internal Medicine department of a Teaching Hospital. Léo Mallat joined SCOR’s Risk Division in 2014. Previously Advisor to the Chairman and Head of Public Affairs, he is now in charge of developing the Group Recovery Plan. Trained in biology, ac-tuarial science and public health law, he began his career as a researcher (CNRS, INSERM, Veolia Environment) and has also represented the French Government on a health and environment working group at the WHO.